While the original already proves itself as an excellent four-door SUV, the Lexus RX L makes for an excellent option for those looking to bring more passengers than before. With third-row passenger seating and a bigger, bolder, and more spacious design, the RX L is the perfect combination of performance, practicality, and all-around progressive luxury. Learn more about this exceptional SUV here at your local Lexus dealer in Kelowna. The Lexus RX L is designed to look expertly chiseled, with lines that promote a streamlined look while displaying sharp angles. The rear window is sloped to give the third-row seat occupants plenty of headroom for a comfortable ride. Its distinct LED head and tail lights are fit smoothly around the car and help support the vehicles sporty look along with the floating roof design. For this edition its interior has a third-row passenger row, which gives you the option of middle row captain-style chairs which fits six people, or the option of a middle bench which gives you an additional seating placement to seat seven people. Both middle and third rows are easily maneuverable by tilting and sliding from a lever release so you can fit cargo of various sizes and shapes. From the outside in, this SUV is as luxurious as it is capable. Both powerful and efficient, the Lexus RX L gives you smooth strength from either engine size. The RX 350L has a 3.5 L V6 engine with 290 horsepower. It includes dual variable valve timing and direct fuel injection. For a step up, the RX 450L’s engine is a self-charging hybrid option that adds two high-torque electric driver motor-generators onto the base level engine. You get 308 horsepower from this engine size for added power and smoothness. Additional power features include active torque AWD for improved traction and drive mode select that adjusts the engine style in accordance with your terrain. Experience efficient power out of the Lexus RX L.
All of the safety technologies in the Lexus RX L will keep the driver and passengers safe within its comprehensive features. 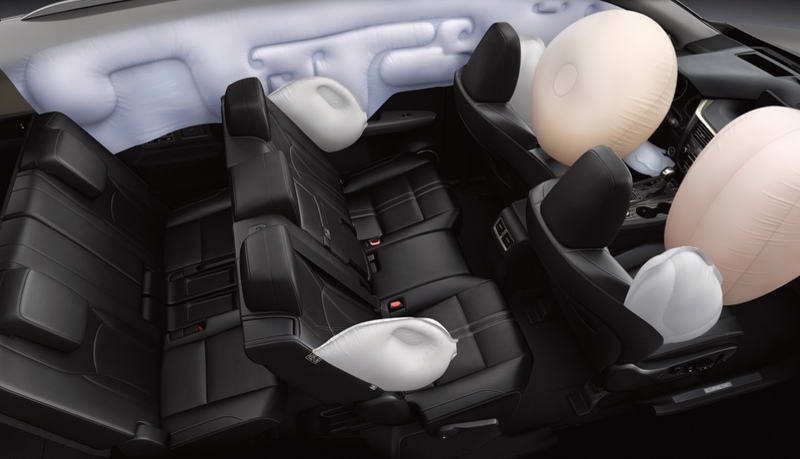 Throughout the entire cabin, 10 airbags have been placed in specific locations to protect everyone inside the vehicle, including side airbags, knee airbags and a curtain row along the entire side of the SUV. A blind spot monitor makes switching lanes even safer as it alerts you to anay vehicles that may have hidden in your blind spot. Cameras are mounted around the entirety of the vehicle to make-up a full image on your internal display screen. It makes parking a breeze when you can see around your whole vehicle. Drive with peace of mind in the safety of the Lexus RX L.
Find the Lexus RX L at Lexus of Kelowna and see and feel for yourself the luxurious power of this versatile SUV. Don’t hesitate to contact us with any questions you may have!